Today’s the day outlets are allowed to run their reviews of the Nintendo Switch, the new console that’s out in two days. Last week we were allowed to share previews and impressions. Nothing about the Switch has changed in the time since, though. The only difference is the amount of time the press has been able to spend with it. The major factor missing from those previews are the system’s online features, and those still aren’t functional yet. There’s a “day one” patch that will theoretically activate those features, but it hasn’t been released in advance. When a Switch tries to connect to Nintendo’s network, it gives an error message about not being to connect to the server. So there’s nothing new to write about today that I didn’t already cover last week. Instead of rewriting what I’ve already written, I’ll simply link you to that piece right here. This is basically our Nintendo Switch review. Go read it! There are only two notes I have to add to the piece from last week. First, many people who’ve played the Switch have seen an issue with the left Joy-Con desyncing from the system during play. That sounds like a big problem. It’s something I haven’t personally encountered, though. I have spent somewhere over 30 hours with the system, across a handful of games, and not once has my left Joy-Con lost its connection. I’m not saying this doesn’t happen, or that it’s not a significant issue that it does happen, but it may not be a problem that occurs with every system. I’ve split my time with the Switch pretty much equally in two different rooms filled with a variety of other devices that generate signals that might interfere with the Joy-Con’s, and have not had any issues. When I flipped the stand open on the back of the tablet and set it to tabletop mode for 1-2-Switch, the blue Joy-Con never disconnected. 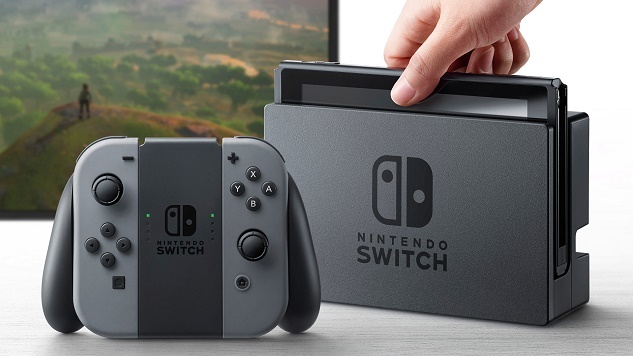 It’s a real problem that could seriously damage the Switch’s reputation if it’s as pervasive in the real world as it seems to be with the review units sent out to press, but from my own experience, it’s not an issue that every user is guaranteed to see. Secondly, I have now been able to play games other than The Legend of Zelda: Breath of the Wild. Two of them, 1-2-Switch and Super Bomberman R, have multiplayer. And hey, guess what: the Switch is a fun little party machine. Between the easy portability of the unit and the Joy-Cons, and the convenience of the tabletop mode, it’s easy to move around and play anywhere. Nintendo focuses on that aspect of the Switch in most of its ads, and they’re smart to do so: dragging your console to a friend’s house used to be a hassle, and now it’s as simple as snapping the Joy-Cons to the tablet and sliding the whole slim kit into a bag or backpack. It doesn’t even take up that much more space in your sack to bring the dock along so you can plug it into a TV. I knew last week that the Switch was a fine addition to Nintendo’s history of handheld gaming, but now that I’ve been able to play some of its party-minded games, I’m impressed by the simplicity and versatility of its various configurations. And I still haven’t been able to meet up with other Switch owners to try out its wireless local area networking capabilities, where up to eight tablets can connect to each other for a multiplayer session. Beyond those two new notes, what I wrote last week still applies. I’ll have more on the Switch once the final pieces of the puzzle have been revealed.